One of the largest importers of panettone to the United States , Frank Lettieri, owner of Lettieri and Co. in South San Francisco , primarily imports the Maina brand. “Maina really stands out is its moistness. 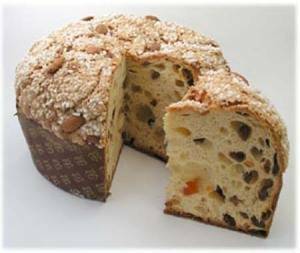 In comparison, many panettoni are dry,'' claims Mr. Lettieri. Valentino USA brings products of the Italian confectionery tradition, like Panettone and Pandoro, in classic or special versions, as well as other goods that are typically consumed by Italians at breakfast, to the United States . Respect for traditional processing systems combined with the application of modern technologies and the support of strict controls over raw materials and finished products have assured Valentino a fine reputation in worldwide confectionery. Valentino USA is a name that guarantees quality and excellence, exactly what you need to celebrate the holidays in peace.